St. James' Court, a Taj Hotel, is a discreet Victorian masterpiece, typifying the concealed charm of one of Britain's finest luxury hotels. When the hotel debuted in 1902 it was patronised by the highest in the land and, today, continues to retain the sophistication of bygone days.This luxury hotel occupies pride of place in Central London SW1, just footsteps from Buckingham Palace and St. James' Park, and conveniently close to Westminster, Victoria Station, the West End and Mayfair. With Heathrow International Airport a mere 45 minutes away, it is perfectly poised for you to explore London for both business and pleasure.From here, you can enjoy magnificent views of the Shakespearean courtyard and illustrious London landmarks. The 338 rooms and suites are ideal for relaxation and indulgence, a perfect synthesis of old-world charm and contemporary sophistication typified by modern state-of-the-art amenities.True food and wine connoisseurs from all over the world favour our collection of fine-dining restaurants. Savour finely crafted cuisine at Bistro, St. James' Courtyard and Bank or Western European masterpieces at Kona. Journey to the banks of Southwest India with our Michelin-starred restaurant, Quilon. Bombay Brasserie serves the best authentic Indian cuisine, and our bars are an experience in themselves.Crisp and elegant, with the signature Taj warmth, we strive to make your visit pleasurable and memorable. Take in the history and modernity of the city from the comfort of your room or on our heritage walk.Unwind and rejuvenate with customised treatments at our Wellness Centre. Shop for a range of luxury lifestyle products with an Indian touch at Taj Khazana. Allow the discretion and expertise of our Guest Services team to fulfil your every desire.Come, experience London in its truest sense! Hotel Features – Centrally located in London, the four-star Crowne Plaza London St. James promises you an exceptional stay, whether you’re visiting the city for a few days or an extended period of time. You’ll be a short walk from many of some of the city’s top attractions, as well as many local restaurants and cafes where you can get a true taste of what London is all about. Guest Rooms – All guest rooms boast the Crowne Plaza’s unique Sleep Advantage program which includes luxuries such as plush bedding, a relaxing lavender spray, eye masks, and ear plugs. Other amenities include an LCD television with premium channels, a mini-bar, coffeemaker, spacious desk, and a private bathroom with plush bathrobes, a hair dryer, and bathroom scale. 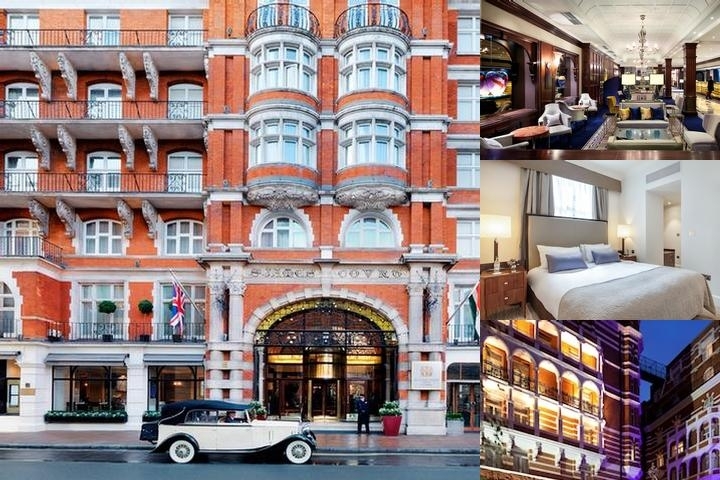 Nearby Attractions – Located in the Victoria – Westminster area, Crowne Plaza London St. James is just steps from many of London’s top attractions, including Westminster Cathedral, St. James Park, Royal Mews, Westminster Abbey, Big Ben, and Parliament Square. Additionally, Trafalgar Square, St. Paul’s Cathedral, and Tower of London are all less than three miles away. Perks & Amenities – The property is a perfect choice for business and leisure travelers alike, with services such as babysitting, a beauty salon, business center, dry cleaning and laundry, and limo or town car service. Other amenities include a spa with a gym, steam rooms, and saunas, as well as a health club, and an on-site restaurant. Expert Tip – A relaxing experience awaits you in the hotel’s Spa at 51. Unwind after a long day of exploring the city with an array of special treatments to choose from. The spa offers customized treatments that include men’s and women’s facials, a sports massage, detoxifying wraps, a sea-salt scrub, hot-stone massage, and much more. The spa is also home to a peaceful courtyard with a large water fountain—the ideal place to enjoy a sunny day. Below are the meeting, banquet, conference and event spaces at St. James Court a Taj Hotel London. Feel free to use the St. James Court a Taj Hotel London meeting space capacities chart below to help in your event planning. Hotel Planner specializes in London event planning for sleeping rooms and meeting space for corporate events, weddings, parties, conventions, negotiated rates and trade shows.